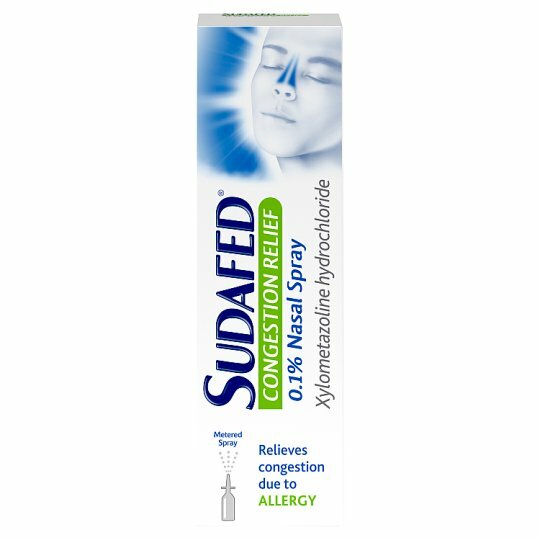 Sudafed Congestion Relief 0.1% Nasal Spray with xylometazoline hydrochloride, works in minutes to help clear stuffy noses and relieve sinus pressure caused by allergies, such as hay fever and colds. It also moisturises and soothes a dry nose. 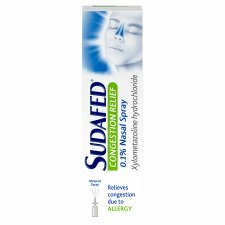 The metered spray gives an exact dose that provides relief for up to 10 hours. This solution contains: Xylometazoline Hydrochloride 1 mg/1 ml, Other ingredients include: Sodium Hyaluronate, Sorbitol, Glycerol, Disodium Phosphate Dihydrate, Sodium Dihydrogen Phosphate Dihydrate, Sodium Chloride, Water for Injections, See leaflet for further information and full directions. Do not use if you are pregnant or breast-feeding. 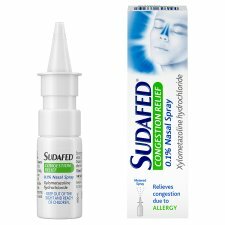 If you are taking any other medicine consult your doctor or pharmacist before using this product. Continuous use for over 7 days is not recommended. If symptoms persist or worsen discontinue use and consult your doctor. Keep out of sight and reach of children Discard 6 months after first opening. Not recommended for children under 12 years old. Do not use more than 3 doses in 24 hours. Keep out of the sight and reach of children.